There are many examples of scientific studies and first hand experience which implicate human visual perception as the result of neurological and phenomenological states, rather than a direct mapping of photons striking the retina of the eye. 1. What we see cannot be explained by the presence of photons alone. “Neurological findings suggest that the human striate cortex (V1) is an indispensable component of a neural substratum subserving static achromatic form perception in its own right and not simply as a central distributor of retinally derived information to extrastriate visual areas. The paper goes on to describe many neurological conditions arising from specific damage to the brain which reveal that the visual conditions which we take for granted, such as identification of shapes and motion, have their neural correlates in diverse areas of the brain. There is no video screen equivalent in the brain which reconstructs an image from the outside world made of photons. “Crick and Koch also proposed that explicit representations of visual features, coarse-coded neural representations that correlate with percepts or objects, are a necessary but not sufficient condition for visual experience. I find no reason to disagree with this premise. 2. Stimulation of the visual cortex in the congenitally blind results in tactile rather than visual perception (Changes in visual cortex excitability in blind subjects as demonstrated by transcranial magnetic stimulation). “…phosphenes could be induced in only 60% of subjects in Group 2 (blind subjects with a low degree of residual vision) and in only 20% of subjects in Group 3 (blind subjects without residual vision). “In a PET study we demonstrate that congenitally blind subjects show task- specific activation of extrastriate visual areas and parietal association areas during Braille reading, compared with auditory word processing. In contrast, blind subjects who lost their sight after puberty show additional activation in the primary visual cortex with the same tasks. Studies in blind-raised monkeys show that crossmodal responses in extrastriate areas can be elicited by somatosensory stimulation. This is consistent with the crossmodal extrastriate activations elicited by tactile processing in our congenitally blind subjects. ” – Different activation patterns in the visual cortex of late and congenitally blind subjects. 3. Visual experiences can be produced internally, and outside of the primary visual cortex. “The results by Knauff and colleagues, also with fMRI, do not support the hypothesis that primary visual cortex is involved in visual mental imagery, but rather that a network of spatial subsystems and higher visual areas appears to be involved (Knauff, Kassubek, Mulack, & Greenlee, 2000). The results support the hypothesis that visual imagery is a function of the visual association cortex.” – Visual imagery without visual perception (Bértolo 2005). 4. Congenitally blind people can interpret experience graphically. 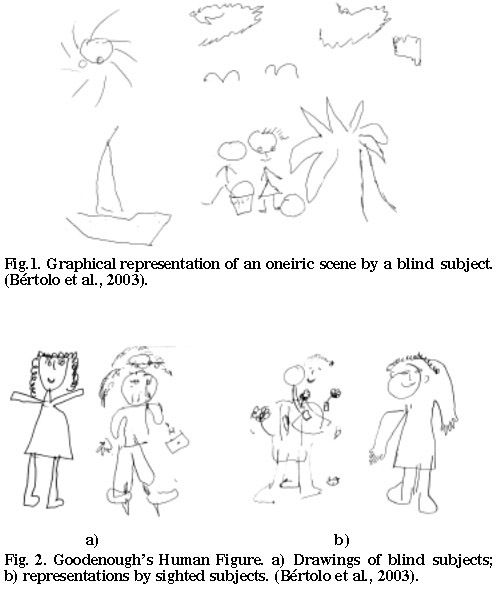 […]In conclusion, the congenitally blind are not only able to describe what may be the visual content of their dreams verbally, but they can provide, through drawing, a graphical representation of such content, and a significant negative correlation between the Visual Content of the dreams and the alpha power was found in both groups.” (Bértolo 2005). 5. Color mappings are not entirely caused either by electromagnetic frequency or stimulation of the retina’s cone cells. “This means that colours only really exist within the brain – light is indeed traveling from objects to our eyes, and each object may well be transmitting/reflecting a different set of wavelengths of light; but what essentially defines a ‘colour’ as opposed to a ‘wavelength’ is created within the brain. 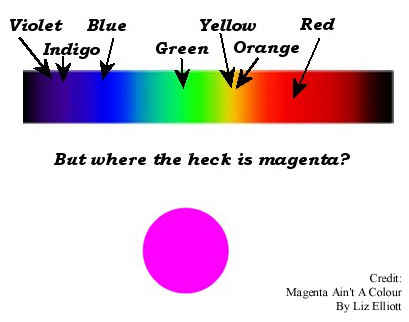 ” – Magenta Ain’t A Colour. b. Color perception can change independently of the retina. “…the number of color-sensitive cones in the human retina differs dramatically among people—by up to 40 times—yet people appear to perceive colors the same way. The findings, on the cover of this week’s journal Neuroscience, strongly suggest that our perception of color is controlled much more by our brains than by our eyes. 6. Blindsight shows that optical information can be communicated subconsciously without a conscious experience of seeing. A rare, but much studied condition, blindsight, along with synesthesia and anosognosia reveal that the pairing of visual qualities of experience with optical conditions is not automatic. The functions of information processing, physics, and the qualities conscious experience can all be teased out separately. 7. Photon interaction begins and ends with the isomerization of rhodopsin. Optical processing a vast chain of mechanical reactions on multiple levels of description of the nervous system; molecular, cellular, organ, and somatic. From the indications of neurology alone, what our visual cortex would ‘see’ should really be nothing more than interruptions in the flows of glutamate from rod cells, not an array of photons. There is something called ‘dark current‘ which refers to “the depolarizing current, carried by Na+ ions, that flows into a photoreceptor cell when unstimulated” and suggests that our access to optical conditions is triggered by a silencing of ‘off’ signals rather than an instantiation of ‘on’. It might be supposed that photons are not what we see, but rather they are a measure of the initial molecular triggers which stop us from not seeing. 8. Photons with frequencies in the infra-red range are felt as heat rather than seen. A rather obvious example, but one which reveals that photons themselves need not be seen to be detected. Ultraviolet and infrared radiation are referred to as ‘light’, but they are no more or less ‘illuminating’ than radio waves or gamma rays. Generally when we refer to light and lighting we are specifying a capacity to illuminate our visual perception, not thermal conditions. The use of light to refer to invisible phenomena is not entirely untrue, as it can be stepped down into a visible range using photographic equipment, however, unless the target of such a process is ultimately a visual experience, it is hard to justify the connection to the term, and the word ‘light’ should be considered somewhat figurative. If we refer to brain activity associated with conscious experience to be ‘neural correlates’, then we should likewise refer to physical activity associated with perceptual experience to be ‘electrodynamic correlates’ of light rather than light itself. 9. 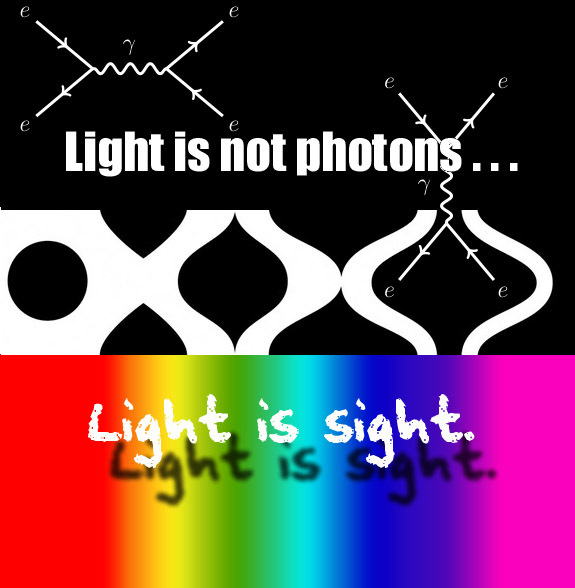 If light is sight and not photons, what is sight? Philosophers would call it qualia, neuroscientists might call it ‘sense data’, phenomenal visual experience, or ‘static achromatic form perception’. In short, seeing light is irreducibly experiential. All light is only that which is seen, and photons do not necessarily have any visible qualities.